This just in: tips for a happy love relationship! For some people, love is a fairy-tale. For others, it can be a lot of work. Every day, I receive hundreds of emails. The most common topic is about how to have a happy love relationship. Depending on each person's situation, the answers can be complicated, varied, and/or mini-novels. 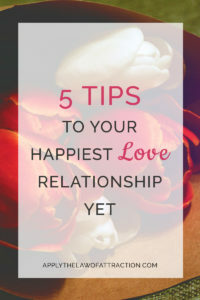 I've written articles, a book, and answered question after question over the years, but after a while, people need more advice on how to have a happy love relationship. Today, I'd like to share with you 5 questions from readers, and my 5 answers that I hope will help you too. I used the techniques in Manifesting Love for a month to start a relationship with someone I work with. Now, I am moving back to my own country. I want to use your techniques there instead of waiting for things to develop here, or should I find another job here? The best way to approach this is for you to consider what you want. The answer to this goes beyond whether you want to be in a relationship with the person with whom you work. You need to consider whether you want to move back to your own country or continue to live in your current country. In which country would you be happiest living? It isn't so much about your love relationship or the other person. You can create a relationship no matter where you live. It's even possible that if you return to your own country, your person might move there as well, even if he/she doesn't currently have a reason to move. But to know whether you should create a relationship in your own country or to find a job in the country you're currently living, you first need to consider where it is you truly want to live. Once you know where you want to live, you will know whether or not you should pursue a job where you're at now, or focus on creating the relationship in your own country. I was abused as a child by my grandfather. It created additional abusive relationships with men as a teenager and an adult. Now I can't think about men without become scared, angry and stressed. I want to be in a happy, loving relationship with a man, but I don't believe it's possible. Do you have any advice? It takes a lot of strength to recognize you have limiting beliefs that are holding you back. You deserve a lot of praise for recognizing them and moving forward to clear them. When limiting beliefs and resistance arise, it's actually a good thing as they are coming up so that they can be released. What you experience when you think about men isn't something to get upset about. Rather it's something to be grateful for because it is giving you an opportunity to let go of the remaining side effects of the abuse you suffered. Remember that you get to choose what affects you and what doesn't. You get to choose how you react to situations. One thing I have learned over the years is that when limiting beliefs and resistance come up, it is because they are attached to a story we're telling ourselves that no longer helps us. Most often, these stories are connected to events in our childhood. For you, the negative emotions you experience may be coming from the experiences you had as a small child. Your little girl didn't know how to handle what her grandfather was doing. She didn't have the words or life skills that you have developed as you've grown up. You see how you're reacting when you think about men as something that needs to be fixed. Your little girl sees it as a way to protect you from being hurt again. If you talk to her, you will probably find what she really wants is to be loved, held and told everything is okay and that you will never allow those things to happen to her again. Remember that you can change your story! When the negative emotions begin coming up for you, take a moment to realign with yourself. Take a deep breath and ask yourself what the story is. What are you trying to tell yourself? What is it that you really need? Take care of your needs and begin working on changing your story to how you can see yourself in a happy love relationship. What is a daily ritual I can use to reach my relationship goals faster? There are some great things you can do. You can pick one or all of them. Keep a love gratitude journal. Every night, write down 5 things that you are grateful for that made you feel or think about love. It can be big or small. It can be anything from a smile from a stranger, a beautiful sunset, a happy couple, or a kind gesture you did for someone. Every day, see yourself as an expression of love and that your purpose is to express love. It doesn't matter whether you're cooking a meal, spending time with friends, or are at work, do something with the purpose of being and expressing love. For most of my adult life, I've read books, taken courses, had counseling, but still nothing happens. My life isn't getting better. I feel like I'm not meant to be happy in my love life. I try. I give up. Nothing happens. Is there something wrong with me? I hear your discouragement, frustration, exhaustion, and self-doubt. You are not alone. There are others who have the same problem. Or if they have seen results, they were temporary. The problem isn't you! THERE IS NOTHING WRONG WITH YOU. What is coming up for you are limiting beliefs. But what if you could take the last step in your journey without limiting beliefs causing you problems? What if you could have a happy love relationship finally manifest for you? The best way to do this is to forget about your goal of a happy love life. Let it stop being important to you. Instead, spend some time doing things that make you happy. When you're able to consistently be happy and keep your vibration high, sit down, close your eyes, and imagine how amazing your life will be when you have the perfect relationship you want. Really feel yourself having this relationship. With your eyes still closed, ask yourself, “What is my main goal in my love life?” Wait quietly until the answer comes to you. It may be the same goal or a new goal, but main thing is that you will be beginning your journey from a high vibration without any limiting beliefs coming up to to get in your way. I've used the techniques in your book to create the relationship I want. Everything is great, but I keep worrying that somehow I am going to mess it up or something will happen and I'll lose him. What should I do? The fear and anxiety you are experiencing are a sign of limiting beliefs. When the feelings come up, don't fight them. Instead, simply acknowledge them and allow them to be. They will begin to fade. When you begin to feel calmer, you can look into what is causing the limiting beliefs. Is it feelings of not being good enough? Is it a fear of failure? Is it a fear of abandonment? Whatever it is, find out what the cause is. Once you do, you can work on eliminating your limiting beliefs and beginning to choose a new story. I'll be honest with you – when it comes to the questions people send in asking for tips for a happy love relationship, the ones above are few and far between. It works the same for everyone…and it works the same in every situation. There are no special rules for you to follow. There are no special techniques you can use. It doesn't matter whether your question is like the ones I answered above or like the majority of questions I receive. The Law of Attraction is the Law of Attraction. It is that simple. The only tips for a happy love relationship that I have are the ones I've already told everyone. I know it might make it easier to think there is a magic formula that can miraculously change your life. But there isn't. The only formula is the one I've written about before. It really does tell you how to have your happiest love relationship. Whether you're already with the person or want to attract them, the same fundamental rules apply. And it always begins with loving yourself more. Always remember that YOU ARE AMAZING!!! Thank you for being you! THANK YOU!!! I am so glad you posted this article. I was looking for some answers regarding love and relationships and it answered most of my questions. The most that i connected to was the 4th tip about ‘staying positive during challenges’. See i have been using the loa for my love life for more than a couple of years now and although it works every time the results are temporary, sometimes days, weeks, sometimes moths. And every time i start over my confidence and faith lowers a little bit. I see now, my limiting beliefs are what’s causing them, never thought of it this way. Ready to start my journey again. Also i loved the ‘ritual for love relationships’, will defintely be following this. I’m so glad they were able to help you! You’re not alone with tip 4. Limiting beliefs are the basis of many instances of lack of confidence and faith, as well as being the most common reason why things will only manifest temporarily. Few people realize it and instead look for the cause outside of themselves when the answers are within them. Have fun with your daily rituals! Thanks for asking! I can certainly look into it. There are also multiple articles on this site about both already. Hey Elizabeth ! I have already read your book! But I didn’t find anything on manifesting a former lover back ? Is there any solution for that? I still get dreams about him also I don’t need to look for him because he contacts me. Hi Fannie, It sounds like you’ve read my book on money, but not my book on attracting a specific person. You can find that book here: Manifesting Love. If you look at the table of contents, you’ll see that it contains the information you’re looking for. Hi. I have a very basic question. How can I control my thoughts? What is the technique? 99℅ time I’m thinking about stupid things. I wanna stop this so bad now. When you notice your thinking about stupid things, simply think about something else. I’ve attracted a beautiful relationship and we’re both very happy with each other. Everything is perfect except for one thing- my partner is a chain smoker and I’m really worried about his health. I don’t give him a hard time about it, but I’m becoming very depressed about this. He tried to quit smoking but in vain. He wants to quit but he can’t. And whenever we have a discussion on this topic, he becomes upset. please help. What do I do? How can I help him quit smoking? Can you please tell me if the following process that I do helps or slows down with the manifesting (of the guy) process. I tell myself mostly good thoughts, I am mostly ok with where I am now, but once in a while, I think there is no hope and that he dislikes me now. ( He previously liked me, flirted etc but I was intimidated and never responded and now he shows zero interest). However, I do very much like him. the issue is now we hardly see each other, except at special events once or twice a year. We are at an event together and he is ignoring me, I tell him that I feel he hates/dislikes me, I am crying and then he hugs me and tells me that it is not true, but in fact he likes me. Why are you visualizing that you feel he hates/dislikes you if you want him to like you? Why are you visualizing something that makes you cry? Of course, you’re not attracting him. You’re visualizing him ignoring you! I am goin through a break up, its been a month , What I believe is that if our thoughts bring about the break up then our thoughts can bring about the relationship we want with a specific person. When we send someone love vibrations , do they really reach them ? Can They feel our love ?